Known Issues: "Sonar Platinum" has been reported to reset the Modelonia program to zero on project load. Modelonia is a novel physical-modelling synthesizer which uses a hybrid of two distinct model 'types' - a plucked-string model and a blown-bore (i.e. trumpet-type) model. Each model may be used simultaneously, and the signal path allows cross-modulation between the two models for more interesting and complex tones. Modelonia is not simply an emulation of acoustic instruments; advanced physical modeling has been used to enable the creation of lively and expressive new sounds and harmonic textures. 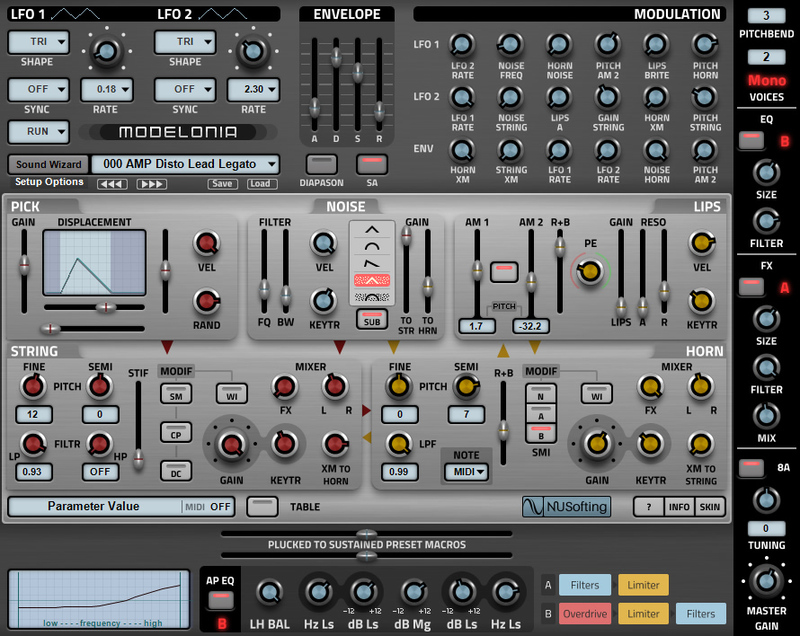 The interface has been designed to be as easy and helpful as possible for newcomers to this synthesis technology, without compromising Modelonia's sound design capabilities. Now fully compatible with Windows and OS X 64-bit, AU and VST. Windows 10 and Sierra Ready. I'm having to give Modelonia a 10, because of what it can do and what it makes one do. Physical modeling is a sensitive technology and Modelonia is quite daring with what sound modification options it offers to the sound designer. Luckily it appears to have a built-in limiter, so at least your ears and gear won't shatter, giving you the chance to explore sounds of an absolutely unique nature. It produces virtually living sounds that I've never quite heard before, but that can be played so naturally and end up sounding so rich that I just have to consider it a must-have for truly musical musicians, but also the wilder kind. Though you can create beautiful hammered instruments of the stringed variety and beyond, my favorite power of it lies within lead instruments of the blown kind. Again, I've never quite heard anything like it, but immediately fell in love with it. If you want to break out of any mold, this is a gem to do so. In a world inundated with Virtual Analog its refreshing to find a developer who's actually trying to invent new things rather than make carbon copies of the old stuff. I mean how many "phat" bass synths does anyone need ? Modelonia is a gorgeous looking and sounding Vsti that tries to do something a little different. One of its many strong points, not flashy but very pleasing to the eye. Takes a bit of getting used to at first because its not laid out in the usual subtractive VA stylee. But once you get your head round what Modelonia actually does the controls start to make sense and the interface reveals its charming clarity. Pretty much everything is midi learn-able at a mouse click and if you get lost theres a ? button which explains the layout. Its an acoustic modeling hybrid that combines string and a horn models in interesting ways to produce a wide range of very organic non electronic sounds. Its got a weirdly baroque nature that kinda sounds like Kraftwerk in renaissance Rome (that may not be historically accurate but you get my drift). You can make fairly convincing string and horn sounds if you want to but i've had hours of fun making mad, lively, organic sounds just messing around playing my midi guitar with CC footpedals controlling parameters in real time. Its no jack of all trades, thank god. Modelonia does something slightly different and it does it really well. Its there built into the skin if you need it , but you hardly do because its so much fun to just play with and find out for yourself. Wide ranging and very good indeed. Theres also a 'sound wizard' section with basic starting points of various acoustic timbres. Nusofting is about the right size for this kind of thing so support is personal and quick ( not that i've needed it ). Luigi and Paul are both good chaps of the highest order. Recently discounted so a total bargain.